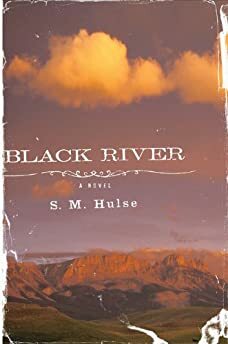 Largehearted Boy: Book Notes - S. M. Hulse "Black River"
Book Notes - S. M. Hulse "Black River"
S. M. Hulse's novel Black River is richly evocative of its Montana setting, an impressively drawn debut about faith and redemption. "Hulse debuts with a stark, tender tale about one man's quest for faith and forgiveness...By making Wes' suffering so palpable, Hulse makes it even more moving when, in the novel's final pages, he achieves something he's been seeking for a very long time: grace. Profound issues addressed with a delicate touch and folded into a strong story populated by wrenchingly human characters: impressive work from a gifted young artist." There’s a lot of music in Black River. Fiddle music mostly, old-time and bluegrass. The title itself is not only the name of the fictional Montana town in which the novel takes place, it’s also the name of a tune composed by the protagonist, Wes Carver, a corrections officer who was also a gifted fiddler before a prison riot put an end to his playing days. In Black River, music is a way for my characters to express love and care for one another, and a way for them to disappoint each other. It brings great joy and even points toward faith and grace. Its loss is potentially ruinous. The music was one of the most challenging elements of the novel to get right, and one of the most enjoyable to write about. I didn’t know much about old-time or bluegrass music when I started writing Black River. Not one to let that stop me, I did lots of reading and research about the history of the music, listened to everything I could get my hands on, and, partway through writing the first draft, took up playing the fiddle myself. The playlist below is broken into two parts: music that appears in the book or directly influenced the music in the book, and music that influenced or reflects other elements of the book. This Bill Monroe-penned tune is mentioned in passing in the novel (it appears on a tape recording Wes’s wife listens to years after Wes has lost the ability to play). I’ve included it here because Kenny Baker was the quintessential bluegrass fiddler, and his smooth, long-bow style of playing helped me envision Wes’s fiddling style. Like a lot of traditional fiddle tunes, "Over the Waterfall" has a fairly tangled history and is probably related to a number of other tunes, but the versions most often heard today can be traced to fiddler Henry Reed, who was born in the late 19th century in West Virginia. It was one of the first fiddle tunes I learned to play, and while it’s often taught to beginners, there are plenty of more complex versions floating around. The two I know are so distinct it’s difficult to recognize them as the "same" tune. In Black River, Wes loves this tune despite its simplicity, and his inability to play it after the riot devastates him. In the book, Wes recalls his father claiming that the Chaconne from Bach’s Partita No. 2 in D Minor is "the world’s only perfect work of art." One of the things I love most about the fiddle is how versatile an instrument it is, and though the music in the book is primarily focused on American folk styles, this is my nod to some of the other amazing music people can make with wood, gut or steel, and horsehair. I’m particularly partial to the version of the Chaconne that Arnold Steinhardt recorded to include with his book Violin Dreams, in which he extensively discusses his evolving relationship with the Chaconne. Duluth-based Trampled By Turtles isn’t a traditional bluegrass band (they’re generally pegged as "progressive bluegrass," "newgrass" or "thrash-grass," depending on who you ask), but this song is the one that always conjures up images of Wes and his buddies playing music together in the good old pre-riot days. I’ve listened to it hundreds of times and couldn’t tell you half the words, but it’s got a great driving rhythm, fantastic interplay between the instruments, and plenty of bluegrassy harmonies and breaks. On its surface, this is a quietly bleak song in the folk murder ballad tradition, but it also has some interesting things to say about change and identity. Isbell has said that "Live Oak" was inspired in part by his fears of losing something essential to his identity after achieving sobriety. "There’s a man who walks beside me / He is who I used to be / And I wonder if she sees him / And confuses him with me." The song touches on questions of how much it is possible to change, how other people react to change, and what might be lost after change, all of which are themes I explore in Black River. I also find that the spare musical style of "Live Oak" reflects a pared-down aesthetic I often strive for in my prose. My father is a serious Bob Dylan fan, and I grew up listening to Dylan both ubiquitous and obscure. "Every Grain of Sand" is somewhere in the middle: a stellar track off an otherwise-forgettable album. In Black River, Wes attends church regularly, says grace before meals, and reads the Bible each night, but he still struggles with faith. Filled with Biblical and poetic allusions, "Every Grain of Sand" beautifully expresses the spiritual connectedness Wes yearns for ("I can see the Master’s hand / In every leaf that trembles, in every grain of sand") as well as the doubts and uncertainties that come with a search for faith ("Sometimes I turn, there’s someone there, other times it’s only me"). This one is cheating; it’s the final track from Remedy, which didn’t come out until I was finished writing Black River. I did listen to plenty of Old Crow Medicine Show while writing Black River, though, and their newest member, Chance McCoy, is a fantastic old-time fiddler whose album Chance McCoy and the Appalachian String Band is in frequent rotation on my stereo. "The Warden" is told from the perspective of a prisoner wondering about the state of the warden’s conscience: "How does the warden sleep at night / After the long day’s through / Does he toss and turn, does his conscience burn / Is he a prisoner too?". The song reflects one of the truths that I encountered again and again during my research, and that plays out in the lives of the characters in Black River: the American prison system, as it exists today, serves very few people well, no matter which side of the bars they’re on. I wrote a lot of Black River while listening to The Highway, the most recent album from Holly Williams (yes, she’s Hank Williams’ granddaughter), and "Gone Away From Me" spent a lot of time on repeat. It’s a lovely song, but a sad one, about family and grief and the desire to return to the past to better appreciate that which is now gone forever. Despite the melancholy subject matter, there’s a gentle beauty to "Gone Away From Me" that tempers the sorrow. I really like that balance, because it’s something I seek in my own work. Much of Black River concerns Wes’s efforts to cope with past losses, both recent (his wife’s death) and distant (his father’s suicide, his music), but while there’s plenty of darkness in the book, there is hope as well.